Paul McCartney's Old Lamborghini is Heading to Auction . Beatles Radio: The Beatles, Solos, Covers, Birthdays, News The Fab 4 and More! 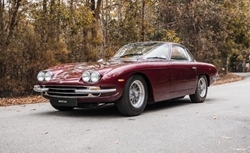 Paul McCartney’s 1967 Lamborghini 400 GT 2+2 is one in a number of celebrity cars that will be sold at Bonham’s upcoming Goodwood Members’ Meeting auction. The Lamborghini was purchased by McCartney at the height of The Beatles’ success and was owned by him while they recorded Yellow Submarine and worked on the animated film of the same name. The car also appeared in ‘Anthology of The Beatles‘ – a 1996 BBC TV series focused around the band. This example, which features a 320 hp 4.0-liter V12, was purchased new by McCartney in February of 1968. It has had just four owners from new, with the most recent acquiring it back in 2011. It has been stored in a climate-controlled environment at Lamborghini Hong Kong for much of that time.